On Wednesday, construction began on Avery Dania Pointe, a 600-unit rental project in Broward County’s Dania Beach. The first phase of the development calls for an eight-story building containing 264 apartments offered in one-, two-, and two-bedroom plus den layouts. 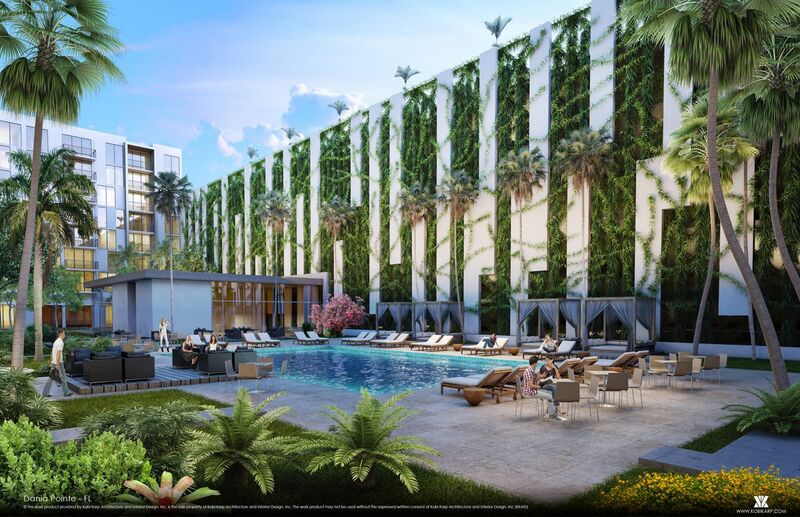 Developed by the Meyers Group and designed by local firm Kobi Karp Architecture, Avery Dania Pointe will feature resident amenities such as a fitness center, yoga studio, private theater, pool deck, and a resident lounge. For all of its bells and whistles, units here are priced at a relatively attainable level with monthly rents starting around $1600. The apartments are just one piece of the greater Dania Pointe project—a 102-acre mixed-use project from Kimco Realty Corp. located east of Interstate 95. Work on the retail entertainment phase of the Dania Pointe master plan began earlier this summer and will include two hotels, at least 18 restaurants, a Lucky’s Market, and a bowling alley. Phase one of Avery Dania Pointe is expected to open in early 2020. The project’s 336-unit second phase will launch sometime in the next two years when phase one is at or near completion. That timeline could accelerate if leasing goes quickly, an executive with the Meyers Group told the Sun-Sentinel in July.